• Identify physiological escalation patterns that can interfere with listening and learning. • Conduct conflict assessments to identify professional, interpersonal, and rights-based issues. • Apply learning to local organizational issues and identify pathways forward for improvement. Continuing Education Credits: This program has been submitted and is pending approval for MCLE, HRCI and NASW. Registration closes June 5, 2018. Take advantage of early registration discounts through May 15, 2018. A group rate of $100 per person is available to encourage teams of four or more people from the same organization. 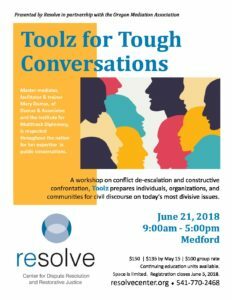 Call Resolve to register groups.